•Five different resistance tube options: black (10lbs), purple (15lbs), red (20lbs), 2 blue (25lbs), yellow (30lbs), 6 resistance bands, freely selectable. •Elastic training Rally requires minimal storage space and can easily set up anywhere. •Features: Suitable for all kinds of fitness level.lose Fat 、build Muscle、stretching、warming up、yoga、pilates、rehabilitation. 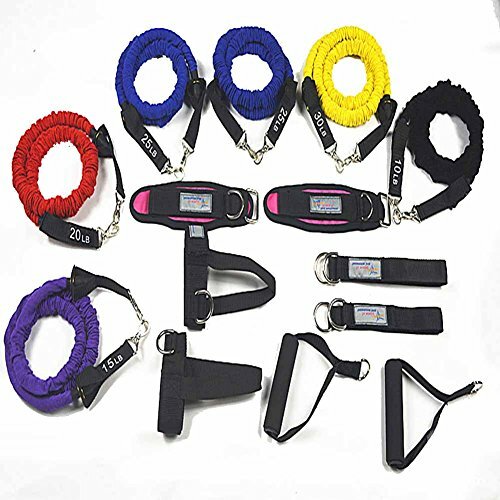 1.Full sets include: Black (10 lb), Purple (15 lb), Red (20 lb), 2 Blue (25 lb), Yellow (30 lb), six resistance bands, 2 Door Anchor,2 Handles,2 Ankle Straps,1 Carrying Bag,overall tension force 100LBS, can be freely combined for home fitness use. The elastic rope is made of high quality natural latex material and has a strong stretchability to ensure long service life and safety. Perfect for physical therapy and workout :Resistance band training are extremely effective at burning fat and increase muscle strength, and also help you boost stamina, flexibility, range of motion, exercise different muscle groups, such as shoulder, arm, leg, back, stomach and etc. Make plan: The gym delivers anchoring solutions and workouts for any situation ,We use high quality materials which provides an excellent experience while caring for your safety. Lightweight, portable and strong.With this Resistance Bands ,you can begin your whole-body sculpting workout only at home 、gym and travel.It will be ideal for increasing strength and mobility.